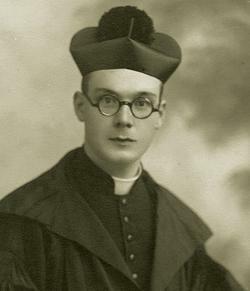 Canon Prof. John Theuma Relf (1910-1941). In his article, ‘The blitz on HMS Illustrious 70 years ago’ (The Sunday Times, January 30), Charles Debono rightly said that “bombs rained down on the dockyard and adjacent areas, but the carrier received only one hit, causing superficial damage”. Unfortunately, the same cannot be said about Senglea. Despite their fierce dive-bombing attacks, the Germans were not accurate enough. They hit the Illustrious once, but they hit almost everything else in the neighbourhood. Cottonera, especially Senglea, suffered heavy damage. Most of the Basilica of Our Lady of Victories was reduced to rubble together with a good number of dwelling places. The picture accompanying Mr Debono’s feature, showing Victory Street in Senglea, clearly illustrates the extent of the destruction. On the evening of January 16, 1941, as the smoke and dust drifted slowly in the breeze across the ruins, this bombed-out city offered a macabre sight. That unforgettable day was washed with the blood of innocent victims; it was bathed with the tears of those who picked up, from among the ruins, the lifeless bodies of their loved ones. During that ferocious attack, 21 Senglea residents lost their lives, including 30-year-old Canon John Theuma Relf. Prof. Relf, born in Senglea on February 1, 1910, was ordained on July 29, 1934. He graduated from the Royal University of Malta and Lic.S.Script. from the Pontificio Istituto Biblico in Rome. In 1937, at the age of 27, Canon Theuma was selected to teach Patrology, Liturgy and Christian Archeology at the Royal University of Malta. During the Illustrious blitz, he found shelter in the cellar of his house at 187, Victory Street, together with three other members of his family: his sisters Maria Carmela, 34 and Amelia, 21, and his five-year-old niece Beatrice. None of the four ever came out alive again. They were buried beneath the four storeys of their demolished residence.